Our heat wave is nothing compared to what they are suffering in the Midwest, but it’s been a few weeks since a good rain and this is the first time I have seen birds fly directly through the sprinkler’s spray. The early spring brought the bears out of hibernation ahead of schedule and they are showing up all over the place – the most recent within walking distance of our house. Local naturists say that the bears’ feeding schedule has been disrupted and this has somehow sent them in search of alternative sources of food. It is hard to say whether the foxes roaming the neighborhood every evening are part of the trend or the usual order of things. All I know is that I find fur and tails (squirrel, rabbit) and feathers (chicken, hawk, and mourning dove, I think) in the yard almost every day. And last weekend when I went out to see what the kids were doing down the street and it was dark, I heard such a commotion in the woods from all sides when I opened the door that I turned and went back in the house, grabbed my car keys and drove to find them. Our neighbor told me that when he takes his dog out he shines a flashlight in the woods and counts the pairs of eyes that look back. I don’t know what it means – the drought, the snowy fall and snowless winter, the collapsing glaciers – but part of me wonders if while we are inside on our screens trying to make sense of it we can find a way to save the world crumbling outside. 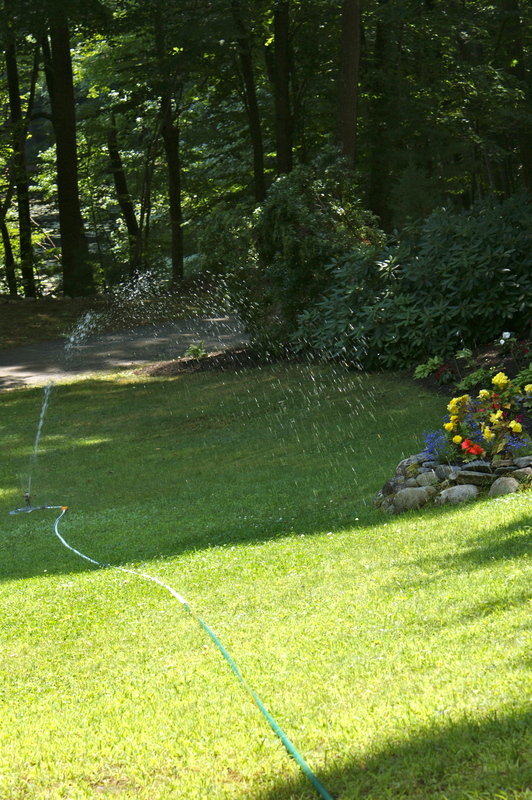 And so I move the sprinkler around systematically to sate each corner of the yard, standing each time for a few minutes, mezmerized by its tick tick tick, and hope that it is enough. Do We Get It Now? The Joker is Real and Batman is Not.